Killian exceeded his Mama's expectations on his first flight. Katie's eight months old baby laughed and played, looked out the window and napped. The flights could not have gone better. If your family is like mine, many friends and relatives live on the other side of the country and the only way to visit involves a couple plane rides. We have all seen (and heard) babies on planes. But is it a good idea to fly with a young child? And if so, what is the right age for that first pair of wings? I did not want to fly with my son as a newborn because he had not yet received the immunizations that would protect him from a variety of illnesses. My baby boy is now 8 months old, he is in great health and has a happy, easy-going disposition so this summer seemed like the right time to travel. But as our recent vacation approached I became apprehensive. Getting to my husband’s home state of Montana from New Jersey means a 12-hour travel day with multiple flights and car rides. I was not only concerned about a long day for my son, during which he would have naps and meals on the fly with very little playtime, but I was also worried about germs and discomfort. I feared that he would spend the flights in tears. So I weighed the pros and cons, ultimately asking myself: is my baby too young to fly? After discussion with his pediatrician, my husband and I decided our trip out west was all systems go. But like all things relating to our son, we needed to take the appropriate precautions and preparations to ensure our little one would not be negatively impacted. 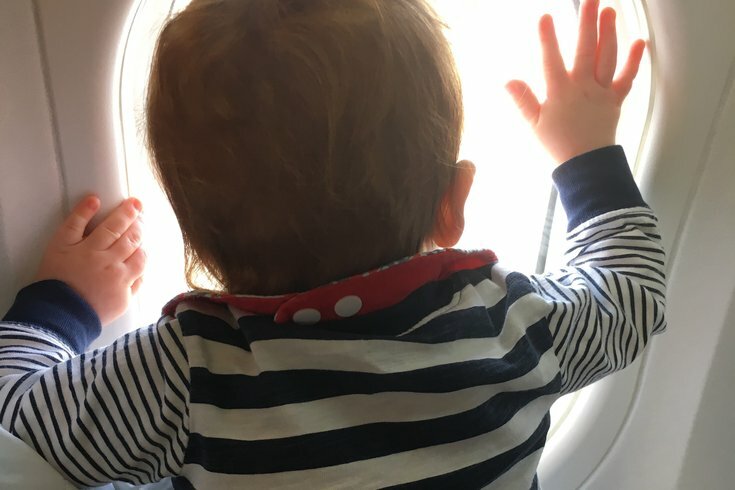 Here are some tips for flying with a baby based on information I obtained before my trip and my family’s recent experience. I spoke with Killian’s pediatrician a couple of times in advance of our flight to confirm that flying with my 8-month-old son was a good idea. She gave me the go-ahead and great guidance. I always encourage parents to seek advice from their pediatrician. It also is imperative to speak with your airline before you book your ticket to understand their policies for traveling with young children. If you are flying with an "infant in arms," like I did, you will need to provide your child’s full name in advance of going through security. Going through TSA security is everyone’s favorite part of flying, right? Of course not. Since my husband and I were TSA Pre-Check it made this portion of the programming easier. I still acted as if it was my first time flying, though. I was so pre-occupied with my son I forgot to take my cell phone out of my pocket. Flustered and embarrassed I was sent back to the conveyor belt to scan the offending item. To the man who told me to take my time and no worries: thank you. A bit of kindness from a stranger goes a long way when you are traveling with a baby. When going through security, keep in mind that you are allowed to travel with expressed breast milk, formula and juice for your child. Delta is our usual carrier and the one we used for this trip. Like many airlines, it allows families with small children to board early. Do not do it! While it may seem advantageous to board without the hustle and bustle of all the other passengers on the jet bridge, you are simply adding to the time that your little one is going to be cooped up on the plane which can increase chances of an in-flight meltdown. If you are concerned about obtaining overhead space for your carry-ons (like my husband and I were) and are traveling with a companion, have one person board the plane as soon as possible and the other stay at the gate with the baby as long as possible. We changed our outbound flight a few days before we left because we realized that we booked at the worst possible time for our son. Our original flight was set to depart just before his dinnertime with a layover around 10:00 p.m. and landing at what would have felt like 1:00 a.m. We altered our tickets to leave one day later, timing both legs of the trip with his morning and afternoon naps which provided a layover during which we could feed him lunch. Our plan worked perfectly! After we de-planed in Montana, Killian was well rested and on schedule. Our pediatrician said it was fine for us to hold our baby boy on our laps but explained that the safest way to fly is to have him in a car seat with his own seat belt. Most airlines will allow a baby younger than 2 years old to fly for free and be held on an adult’s lap but the Federal Aviation Administration recommends infants ride in properly secured safety seats on airplanes. Killian was really content in our arms, but I am going to consider getting him his own seat for future flights. If you are traveling with a baby, be sure not to book the exit row; airlines won’t allow passengers to sit there with a child in your lap. And though the bulkhead seems appealing because of the extra leg and baby room, you won’t be able to have your diaper bag close at hand during take-off and landing. To help my baby boy with the ear discomfort that can be caused during take-off and landing, our pediatrician recommended that I nurse him and/or have a bottle and pacifier handy because sucking and swallowing can help baby cope with the change in pressure. On a couple of the flights he nursed during these times but otherwise seemed more interested in looking out the window or sleeping. Because planes can be so loud, I purchased a pair of noise cancelling ear muffs in advance of our trip. I did not want baby boy’s naps to be interrupted by the chatty guy in 12A. Killian was comfortable in the ear protection, but there was not an easy way to keep them on once he dozed off. Baby boy ended up sleeping through the noise, sans ear muffs, unbothered. A well-stocked diaper bag is a parent’s best friend. I took a lot of time to carefully prep Killian’s for the flight. I had an array of toys attached to pacifier lanyards which my husband and I clipped onto our shirts because I did not want anything to fall on the dirty floor. In addition to the usual diapers, wipes, diaper cream and lotion I packed two complete changes of clothes, a blanket, baby food, spoon and bibs. I had a bottle for water or formula, a pacifier, one book and hand sanitizer. If you need to change a diaper in-flight, do not take the whole bag with you; there is barely room for you and the baby in those tiny airplane bathrooms! Grab the changing pad, a diaper, wipes and ointment (and hope for no turbulence). I planned extensively for the flights and expected some turbulence as he adjusted to 10 days away from home, but I was not prepared for the after-effects on my son after traveling to a different time zone. As I write this column Killian is fighting his afternoon nap with all his might. He had the same problem the night we returned home. While my husband and I took turns soothing him, I announced that we would never EVER travel again. Of course that is not true. We just had a wonderful vacation seeing Yellowstone National Park with friends and visiting my husband’s family. But it is so hard to witness the negative impact flying across the country had on my young son. In order to deal with the after-effects, we are transitioning back to local time by adhering to his routine but allowing for flexibility. It seems like babies are like all of us: They need a vacation after the vacation! I am sure after a few days, all will be back to normal, and for many years we will treasure the memories and experience of this trip. Do you think babies under two years old should fly? Do you have any tried and true tips for air travel with your little ones? Share with me and other parents in the comments section below or Tweet me @ThePhillyVoice and @KathleenEGagnon.